Are you fed up of the whole gift wrapping scenario? 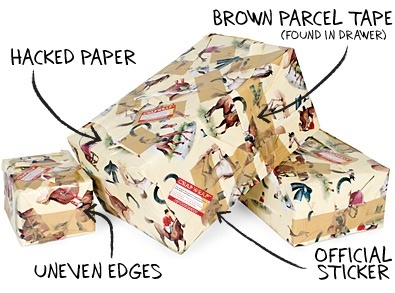 Are you one of those people who cannot wrap presents to save their life? Do you just want to stick your middle finger up to wrapping presents and make a mockery of perfectly presented items? If you answered YES to any of these questions, then crapwrapping may be just what you are looking for. It is exclusively available at Firebox, the online gadgets and gizmos superstore. Simply select the products you would like to purchase, then select individual or multi wrapping at checkout stage. For further info you can find out all about Crapwrap here.